part of the gîte, Le Manior des Granges, after a wonderful week of rest and relaxation. Although we did relax, we also did some exploring of quite a few areas including the second largest city in the region of Limousin, Brive, directly east of the of where we were staying. One of the stereotypes that Americans have of France is that all of the larger cities in France look like Paris, Bordeaux, Marseille, etc. whose architecture is of the sixteenth or seventeenth century. There is no doubt that the French have strived to preserve most of their architectural history by restoring buildings from the past. But even with all that effort, time marches forward into the future. And while during our journey of discovery, we have followed a path that has been to places that reflect its history, France is surely if slowly embracing the future. 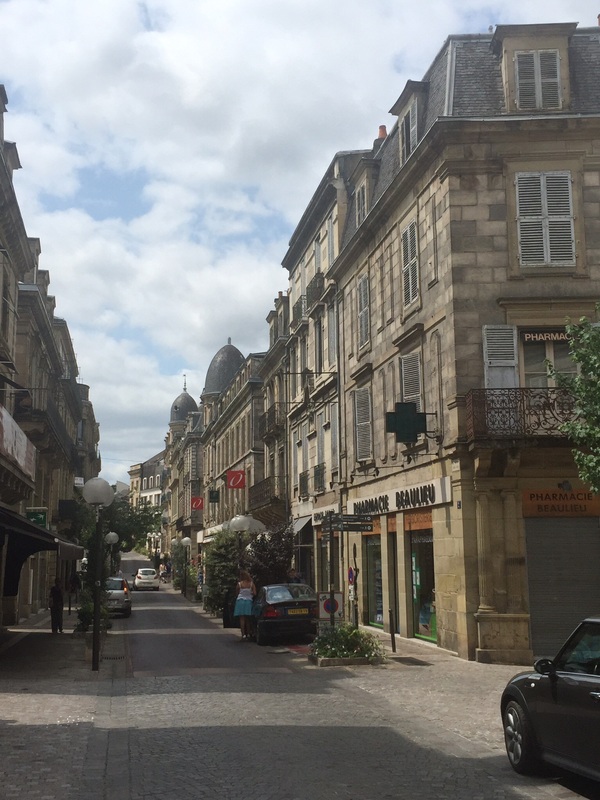 The thing that shocked me about Brive was that on the road approaching it, on the outskirts, there were areas full of modern shopping centers, outlets, and malls selling anything and everything one could desire. It wasn’t any different than what one could find back in the U.S. There were also areas of industry, large factories, some operating, others not. Having stayed mostly near towns and villages with rough stone construction for the past four weeks, entering the outskirts of Brive pulled us forward into the present. Funny how being in one environment for several weeks makes you forget about the other realities nearby. On the way back, we took a circuitous route that took us through many valleys, mountains, and forests as well as open plains all of which had hundreds of small villages and towns. It made me realize that there must be a fundamental reason why so many small and isolated places could exist. Some were very far from a city that could provide essential services. Many didn’t even have a grocery store or a gas station. In our many readings about France we learned that the medical services here are extraordinary, and talking to one of our hosts of an earlier gîte, we learned that even though they were relatively far from a larger city that could provide hospital and medical services that they needed, the patient was ferried from their home all the way to the largest city in the region, almost an hour away, by taxi! Not only were the vast majority of the hospital stay, medical tests and service expenses covered, the taxi ride was completely paid for as well! And after returning home to recuperate, a nurse would visit the patient once a week until he was deemed able to recover on his own! Back in my younger days, I was in a bicycle accident and was taken by ambulance to the hospital less than a mile away. The bill for the ambulance ride…….$1,000. And that was more than 25 years ago. In many rural areas, doctors make home visits. When was the last time you had a nurse or doctor visit you at home? So, the only thing I can surmise after we spent a few hours traveling through and stoping in several very small and remote villages, is that there must be a system whereby these isolated villages are provided essential services that allow for their existence. Well, what was I saying? Oh, yeah, on to Bergerac!